We spend thousands of dollars and invest hundreds of hours of classroom instruction in educating our kids. After 12 or more years, what do we expect them to know? What are we getting for our money? My question assumes that, like E.D. Hirsch argued, there is certain “core knowledge” that is essential. It’s not enough for students to have some vague set of skills or good “midos” or hashkafos. They need to have real facts and information at their fingertips. 4) Understanding basic principles of belief (this point needs a post of its own to define better). Sounds simple, but I challenge you to test your average Beis Ya’akov graduate and see if she has mastered the items on my list. My own kids have gone to what is considered a more academic B.Y., one which comparatively speaking does provide a decent education, and they complain to me that I’m being unfair when I expect them to know a pasuk and Rashi that they never learned in school. What is worse than girls not having learned this stuff in school is the fact that they never given the message that they have to learn it on their own, not because of the mitzvah of talmud Torah (which of course does not apply to girls), and not because they will do some kind of aveirah if they don't know a Rashi somewhere in Sefer VaYika (a very unlikely prospect), but simply because how can you live as a thinking Jew, a Jew who wants to connect with Torah = with G-d, if you don't even know chumash and Rashi? 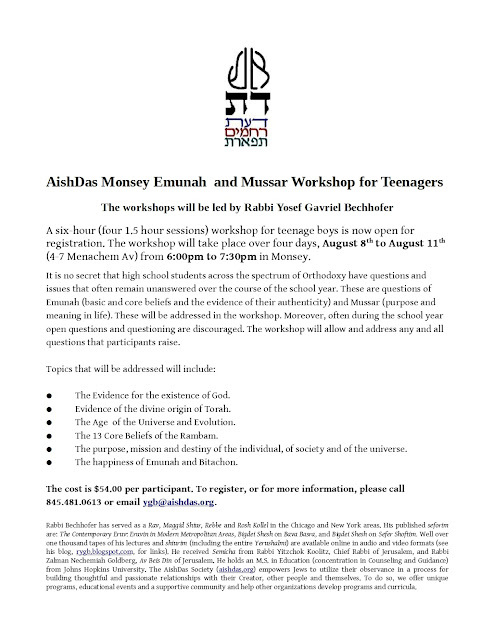 A six-hour (four 1.5 hour sessions) workshop for teenage boys is now open for registration. The workshop will take place over four days, August 8th to August 11th (4-7 Menachem Av) from 6:00pm to 7:30pm in Monsey. The cost is $54.00 per participant. To register, or for more information, please call 845.481.0613 or email ygb@aishdas.org. Rabbi Bechhofer has served as a Rav, Maggid Shiur, Rebbe and Rosh Kollel in the Chicago and New York areas. His published seforim are: The Contemporary Eruv: Eruvin in Modern Metropolitan Areas, Bigdei Shesh on Bava Basra, and Bigdei Shesh on Sefer Shoftim. Well over one thousand tapes of his lectures and shiurim (including the entire Yerushalmi) are available online in audio and video formats (see his blog, rygb.blogspot.com, for links). He received Semicha from Rabbi Yitzchok Koolitz, Chief Rabbi of Jerusalem, and Rabbi Zalman Nechemiah Goldberg, Av Beis Din of Jerusalem. He holds an M.S. in Education (concentration in Counseling and Guidance) from Johns Hopkins University. 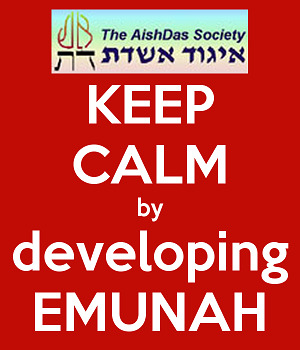 The AishDas Society (aishdas.org) empowers Jews to utilize their observance in a process for building thoughtful and passionate relationships with their Creator, other people and themselves. To do so, we offer unique programs, educational events and a supportive community and help other organizations develop programs and curricula. My impression is that this rabbi is very popular. He seems very sincere and k'shmo kein hu, humble. But I don't like the approach. Tzeniyus is not important because men might sin by looking at an un'tzeniyus woman. 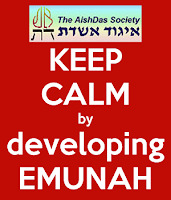 Tzeniyus is important because it is a manifestation of Hatznei'a leches im Hashem Elokecha. As in Micha's Ma Hashem Elokecha mevakesh. I just noted this song as a talmid's chasunah a couple of weeks ago. I looked for in on youtube and found this clip. I have listened to it dozens of times! Uplifting and inspiring.